This post was sponsored by Sara Lee®. Thank you for supporting our sponsors. It helps keep us going! We are always trying to come up with new recipes for the summer that are crowd pleasing but also fairly easy to put together. 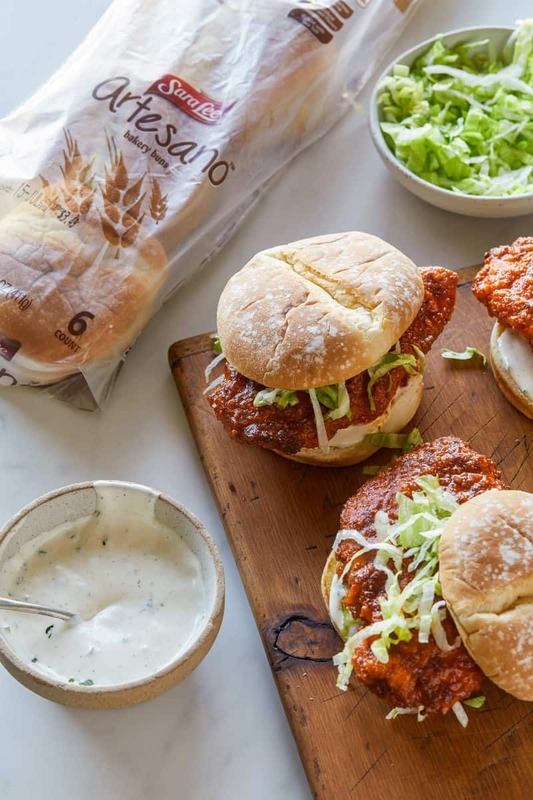 Last year Hot Chicken Sandwiches were super popular so we wanted to take a stab at making a baked version that we could enjoy all summer long. Baking the chicken makes it so much easier to make this recipe for a bigger group of people. 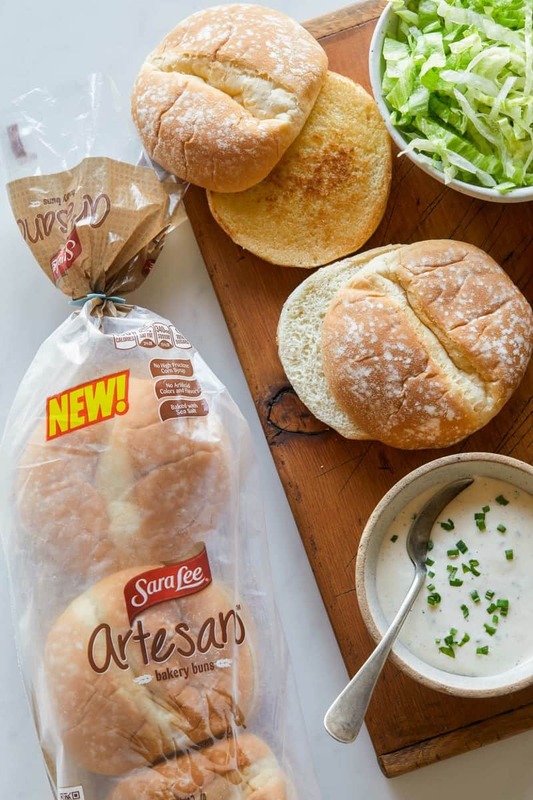 We paired our hot chicken, shredded lettuce and buttermilk ranch with our new favorite go to buns – Sara Lee® Artesano™ Bakery Buns. You can find them at most grocery stores and we absolutely love the soft texture. They are also perfect for burgers too! We also love the fact that there is zero high fructose corn syrup. 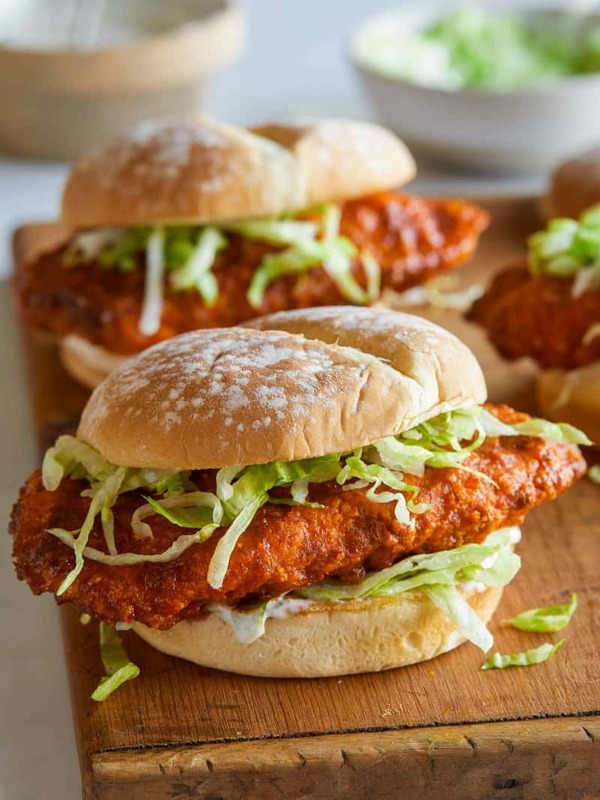 They make it the perfect bun for our Baked Honey Hot Chicken Sandwiches! Enjoy! 1. Lightly season chicken breasts on both sides and place in a shallow baking dish. 2. Pour buttermilk over chicken, cover with plastic wrap and refrigerate for 2 hours. 3. In another shallow baking dish combine flour, breadcrumbs, garlic powder, turmeric, smoked paprika, baking powder, salt, and pepper. 5. Remove chicken breasts from buttermilk, one at a time, and dredge them in the flour mixture until fully coated, shaking off any excess. 6. Transfer coated chicken to a well, greased cooling rack placed over a baking sheet, about 1 1/2 inches apart. 7. Spoon 1 tablespoon melted butter over each piece of chicken and bake for 20 to 25 minutes or until coating has browned and the chicken has cooked through. 8. While chicken is baking, combine remaining 1/2 cup butter, honey, smoked paprika, cayenne pepper, and salt in a small mixing bowl and whisk together. 9. Once chicken is done baking, remove from oven and brush spicy-honey butter all over each piece until well coated. 10. 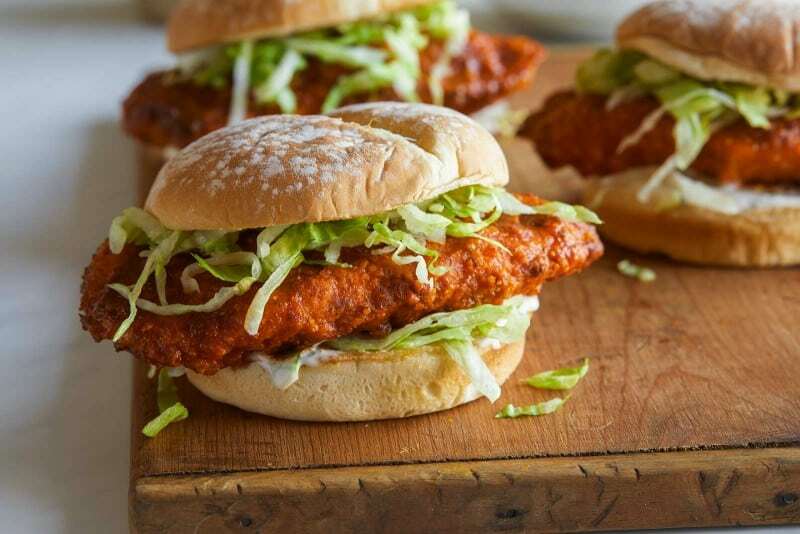 To assemble: Spread ranch over the bottoms of each bun and top with a piece of honey hot chicken. Top chicken with a handful of shredded lettuce and more ranch. Place top buns over each sandwich and serve. These look seriously awesome! I LOVE hot chicken. The hotter the better. Nicely done. My husband and I absolutely loved these. I love spice and his stomach can’t always tolerate it and this was a perfect medium for both of us. Great recipe! Oh yay!! So glad you enjoyed them!! Made this it was amazing but i thought i might bring up the ingredients ask for garlic powder but it’s not in the directions. Ah, thanks so much for letting me know! It’s for the “dredging mixture”…will update shortly! 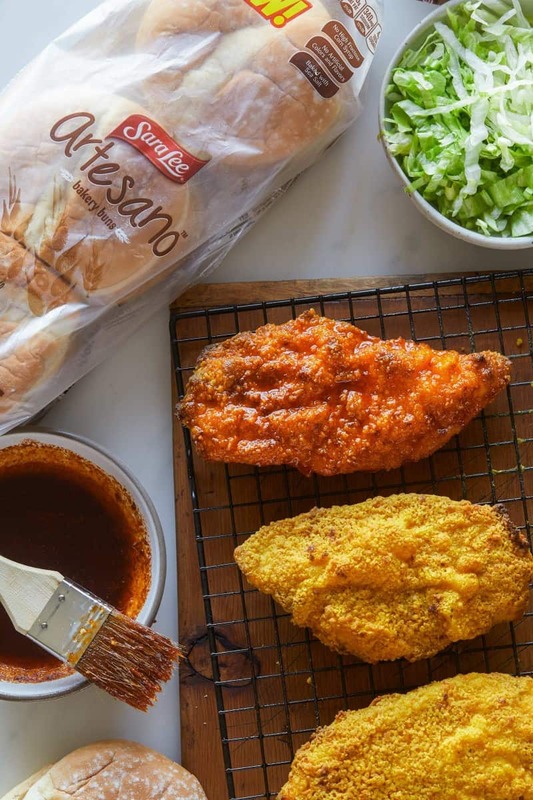 Could you use regular Italian bread crumbs?? Yes, the texture will just be a little different…you won’t get quite the same “crunch” but still delicious! The best spicy chicken sandwich I have had! These were restaurant worthy. I made them exactly like the recipe and they were perfect. How long can I keep the chicken in the buttermilk? I’m thinking I want to do this step ahead of time. Thanks! In step 1 it says to lightly season chicken, what do you season it with? I don’t think I either added enough salt and/or cayenne. Super good and fairly easy. Happy to bake them since there’s so much butter anyway! We have made these twice so far. Absolutely delicious. We did, however, substitute olive oil spray on top of the chicken instead of drizzling the butter. What does it mean by lightly season? With what?